Well, kind of. Two are the same kind I usually make. The third one is a new one. I love the red and ivory one. I’ll probably make one for myself someday. 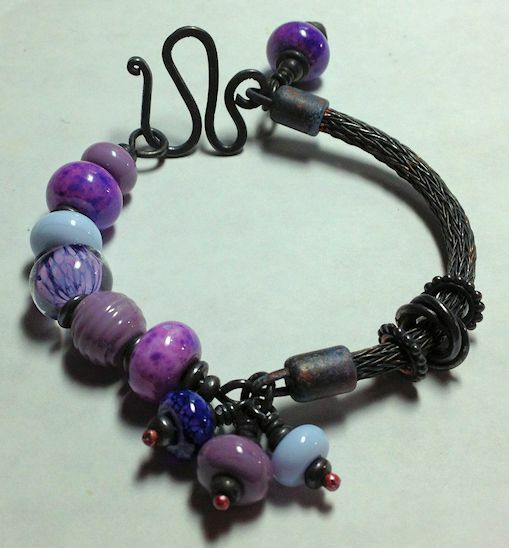 This is the new one with a piece of viking knit for half the bracelet and beads on the other half. The viking knit is make out of copper wire. It’s made on a dowel, then pulled threw a drawplate. I carry a bag with my viking knit stuff all the time so whenever I have a few minutes I can work on it. It takes a while to get a long piece made.